The word “badass” is part of every biker’s vocabulary. Not all bikers, though, seem to merit its application to them. While there are a lot of things that go into being an awesome rider, one of the most important is a matter of costume. 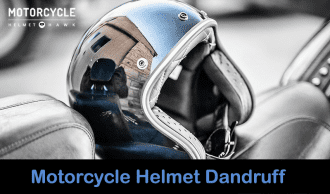 Badass motorcycle helmets can give you an undeniable punch of style, and the best ones will do it while fulfilling a lot of practical requirements. 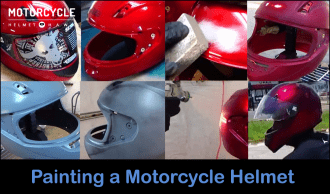 A truly killer helmet should fit right, look right, and work right. 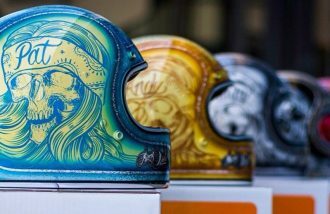 Below are five of the coolest yet most affordable motorcycle helmets you can get today. The Rogue Helmet is styled to live up to its name: reminiscent of a rogue warrior traversing the “Mad Max” landscape, it’s available in several finishes including your basic black. It comes with Bell’s five-year warranty and is DOT-approved for safety. The plastic muzzle can be removed for open-face riding, and the liner is washable. It comes in range of sizes from XS-2XL with a $$$ price tag. This is one badass helmet, no two ways about it. 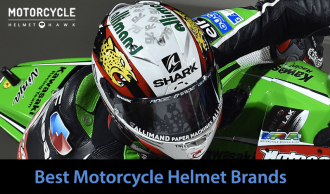 The styling is really much of what sells this product, although you may be interested in it as well if you want a convertible three-quarter-to-open-face helmet specifically. Either way, its looks are so cool that it’s sure to make you a head-turner—and it won’t shortchange you where safety’s concerned either. 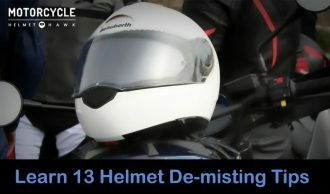 Just don’t expect the muzzle to do much for your face if you tumble facedown; it’s really more to protect your mug from flying debris while on the road. 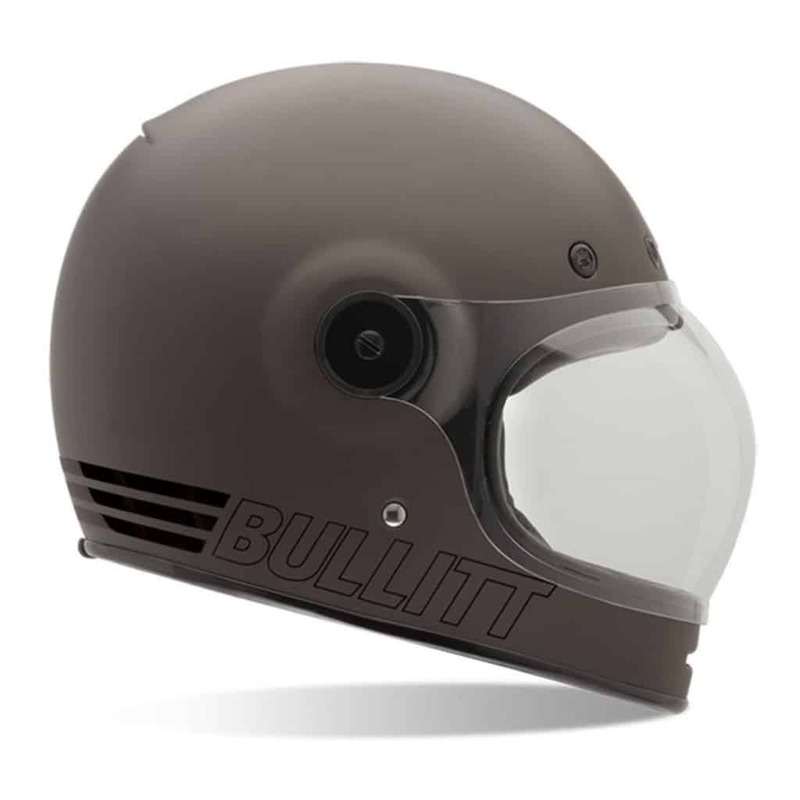 The Bell Bullitt Retro Helmet offers inimitable retro styling, with its ultra-low profile and “humped” eyeshield. A reinvention of the Bell Star, it is DOT certified and comes with a thick EPS liner, metal mesh vents, removable shaped cheek pads, and built-in space for speakers. It costs about the mid 3 figures and comes in matte titanium, blue, white, matte black, and racing-stripe color options. This is one of the most badass helmets out there based on appearance alone. The Bullitt will get you looks wherever you go and, most importantly, happens to be a joy to wear if you get the sizing right. The only real gripe most will have here is the price, although it should be said that this is probably to be expected for a helmet of this high level of quality. 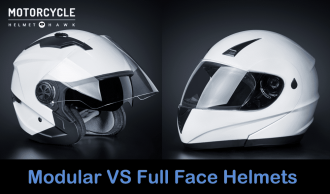 A modular helmet, the Shark Evoline Series 3 Helmet can be used in open-face (three-quarter) or full-face mode. This is achieved by the swinging chin bar, which can be rolled up and snapped into the back of the helmet. It has two visors: a clear outer one and a tinted inner one (the sun shield). It has DOT certification as well and comes in sizes XS-XL. Expect to pay for this model. The only real downside of the Evoline Series 3 in terms of function is a tendency to be noisier than most of its full-faced peers—but that’s usually the cost of having a modular helmet, as they tend to have more gaps to allow the moving parts to work. Still, it won’t be as noisy as your average open-face (non-modular) helmet. Everything else works in its favor aside from the price, including the sharp styling, awesome build quality, and comfortable design. 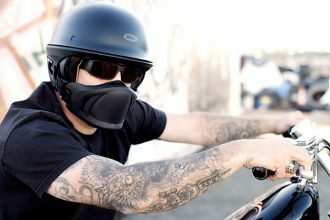 And as far as the coolness factor goes, there are few things more badass than the suave way this helmet converts from open- to full-face protection. 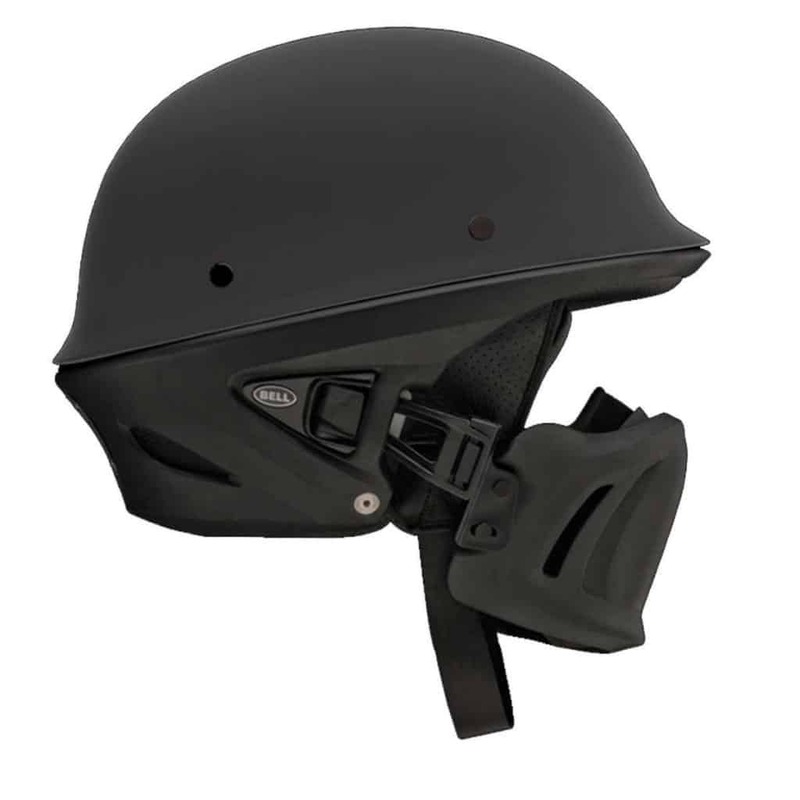 The BILT Techno is an injection-molded helmet with an inbuilt DWO-3 Bluetooth system. The system can be used to link the rider to various digital conveniences, like his mobile phone, intercom tech, a digital music player, GPS, and more. It has a clear external shield and a flip-up sun visor. Furthermore, it is DOT-standards-compliant, comes in sizes up to 2XL, and has five different color choices. 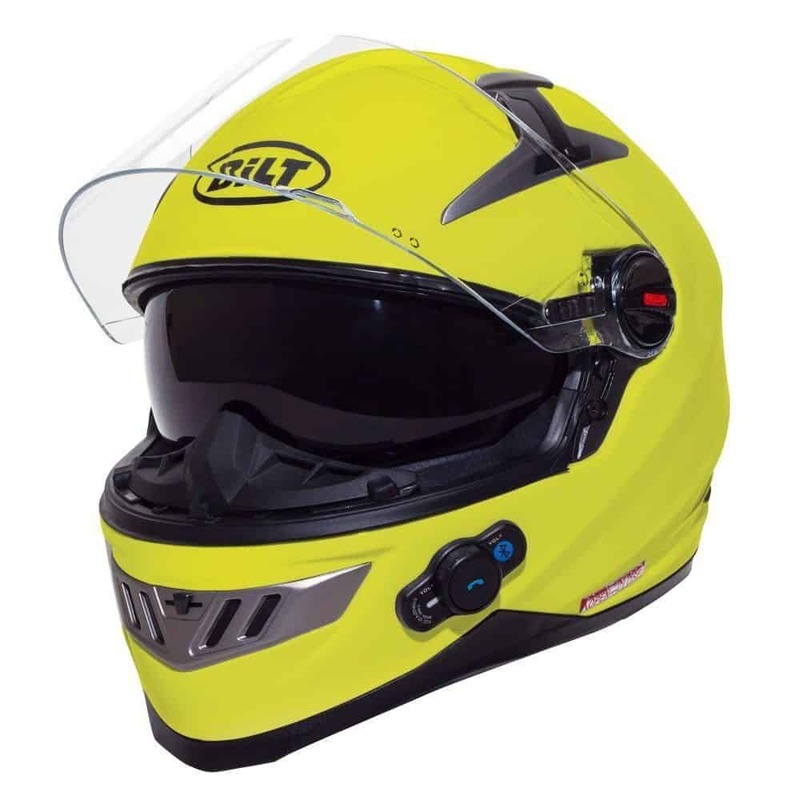 The BILT Techno is a badass-looking helmet that almost seems to take a few style cues from old-school Japanese Kamen Rider hero films, particularly when the exterior visor is up and the inner one is down. 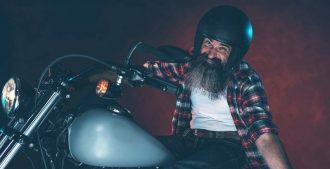 The integrated Bluetooth gives it special “badassery,” as it means you won’t have to spend even more money just to get that useful function on your riding helmet. 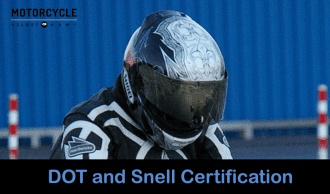 BILT’s Techno helmets can actually communicate with each other using this technology, so it can come in handy if you know a friend with the same model. Another of today’s integrated-Bluetooth helmets, the TORC T27 is a compact and modular helmet influenced by European styling. The Bluetooth comes with two built-in speakers, a microphone, and glove-friendly controls that are also water resistant. 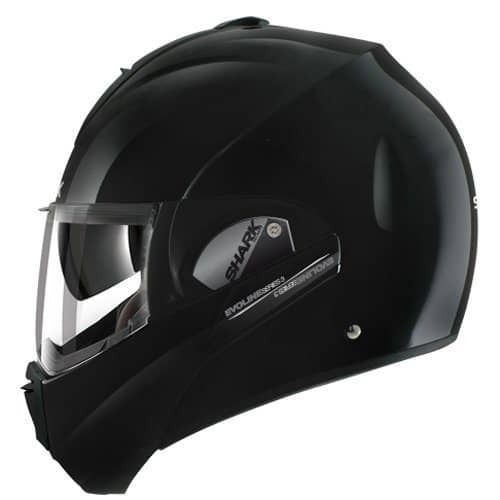 Available in silver, yellow, and black color options and XS-XL sizing, this helmet costs about $200. 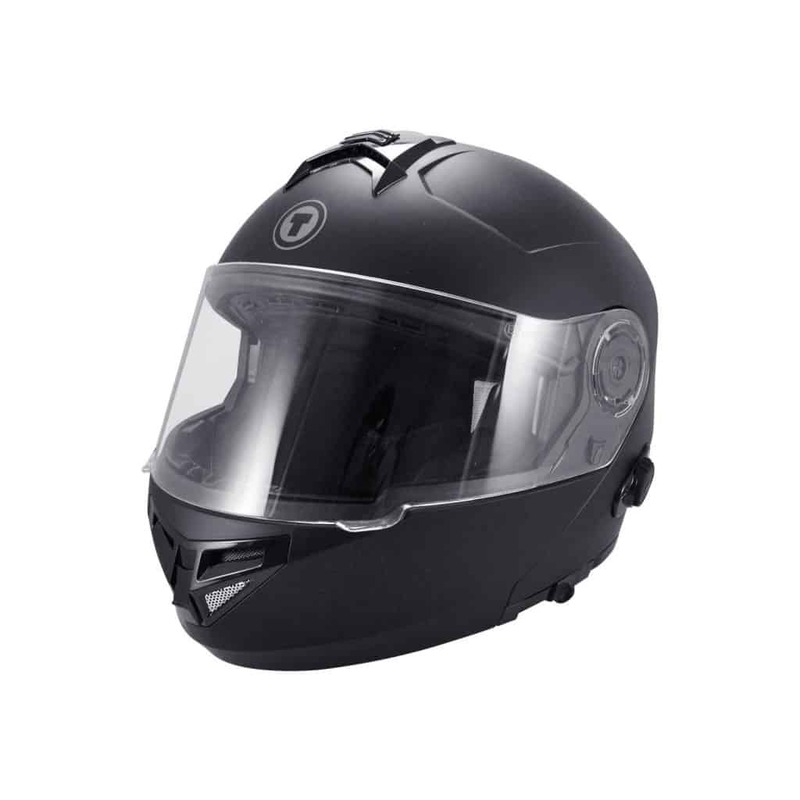 This is one badass helmet; despite costing a couple hundred bucks, it manages to deliver solid Bluetooth and communication functionality, ultra-cool style, and rock-solid protection. It’s a testament to how well built the helmet is that it looks and feels better than its actual price. So, which is the most badass buy? It’s hard to say because preferences differ, but the Shark Evoline takes the prize. Its unique design means that it doesn’t look like a modular helmet when in open-faced mode, and the smoothness with which you can make the switch-up just can’t be matched by standard modular helmets. It’s badass, yes, but in the most suave of ways. As for runners up, nipping at the Evoline’s heels are the two Bell models because of their memorable, unapologetic style. Go for the Rogue if budget is your primary concern; that’s ultimately what places it above the Bullitt in terms of second- and third-place rankings. 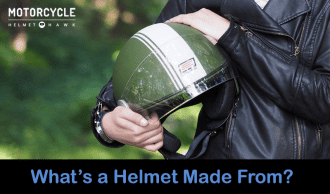 Awesome Motorcycle Helmets: Top Picks and Reviews Motorcycle Safety Feature – Are Half-Helmets Safe? 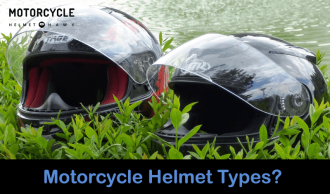 Best German Style Motorcycle Helmets – Highest Rated And Most Popular Safety Feature: Modular Verses Full Face Helmets – Are Modular Helmets Safe As Full Face Helmets?